A Labour government would ruin Britain’s recovery and destroy the economic credibility by causing the business confidence that Tories have installed to “evaporate in minutes,” according to Chancellor George Osborne. 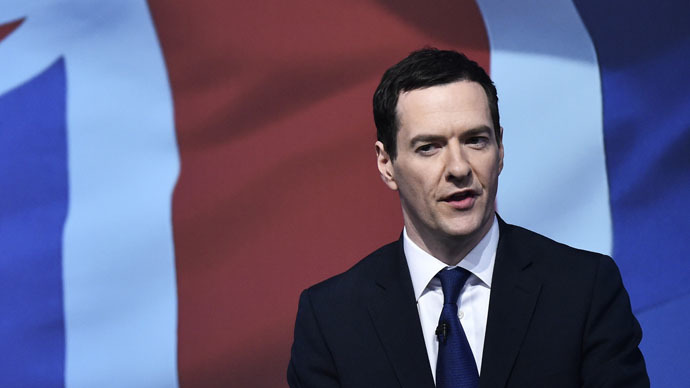 Speaking to the Financial Times, Osborne warned a Labour government – particularly one aligned with Nicola Sturgeon’s Scottish National Party (SNP) – could derail the coalition-orchestrated recovery by scaring off investment. “The world would take one look at the UK and this unlikely alliance between Ed Miliband and Scottish nationalism and say: ‘That’s not the place we are going to put our investment,’” said Osborne. The free market acolyte added that Miliband and Labour were certain to “meddle in markets” if elected on Thursday. Despite his confidence, Osborne has faced sustained criticism for his economic approach throughout his tenure as chancellor. One of the most contentious issues is the increasing number of people forced to use emergency food banks since the Tory-led austerity program came into effect. Last month figures suggested that food bank use was up 19 percent over the last 12 months. Data from the Trussell Trust’s 445 food banks indicated that emergency food had been distributed to 1.1 million people, up from just over 900,000 the year before. This is a marked increase from the 41,000 people given food in 2009-2010, the period immediately before the coalition came to power. Labour was quick to jump on the figures, pointing out that surveys had shown the main reasons people rely on food banks are delays in receiving state benefits as well as changes to welfare implemented by the Conservative-led coalition. Rachel Reeves, shadow work and pensions secretary, wrote to Prime Minister David Cameron challenging him to pledge to reduce the number of people using food banks during the next Parliament in 2015-2020. “Under your government, too many working people are being paid so little that they can’t afford to feed their families – with 1.5 million more in jobs paying less than the living wage and a huge rise in the number of people on zero-hours contracts. “And too many people who should be supported by our social security system are being let down by it – with delays in benefit payments, unfair benefits sanctions and the bedroom tax pushing people to the doors of food banks,” the letter reads.